“My mother’s coming for two months,” your spouse says, gleefully, then turns to embrace you. There is a sinking feeling, even though there shouldn’t be. All of a sudden, your sense of autonomy, purposefulness and passion are all drained. I married you, not your mother, you think to yourself, but don’t actually say it. “Inshaa Allah,” instead you respond. However, your heart tightens, and you ask God to give you the strength to endure another visit. All too often, the mother-in-law-daughter relationship is fraught with tension and resentment. Seldom do we encounter examples of these two women really thriving in their relationship. In the first article in this two-part series, I suggested ways for you to organize your kitchen and other parts of your home to improve the relationship. Although the article started by focusing on spices, the final recommendation was to look inward and realize that we all belong to Allah , and that nothing is truly ours — not our kitchen wares, not the deed to our homes, not our spouses, not even our own egos. A constant reminder of this fact will inshaa Allah help as we seek to improve the relationship with our mothers-in-law. In this article, we will highlight more tips, focusing on spiritual expression. What has helped in my own attempt at peaceful coexistence is recitation, not simply the solitary recitation of prayer, but trying to bring recitation into our communal living space. 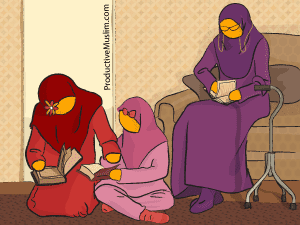 What might my mother-in-law, who spends considerable hours each day with her Qur’an, be reciting? Is she also committing new passages to memory? Could I hold the mushaf for her, and or, vice versa? How may I use the Qur’an to bridge the East-West, Urdu-English, Biryani-Kale smoothie divides? Grandchildren are potential bridges, along with their own recitation, but there is also a relationship that may develop between two adults, existing under the same roof, both earnest in their efforts to live the Sunnah. Surely, a joint recitation of Surah Ya Sin could help reorient us all, and spread His love and noor among us inshaa Allah. Next stop: when did you last undertake any sort of charity project with your mother-in-law? Or have you ever? Imagine, collaborating in your good deeds? If there is tension in the relationship then conceiving of this project may be inconceivable (not to mention all the other demands on your time). Start simply by making du’aa about it. Then approach it, slowly. Perhaps it could begin by a visit to a local mosque/food pantry to drop off food together. It need not be exclusive, i.e. other family members are welcome to join but the point is that you are trying to build a relationship with a specific individual, rather than letting a key relationship lie idle. Now, imagine Prophet Muhammad’s home. Yes, imagine it. Try to think how you and your mother-in-law would fit in to that home, and how any real or perceived differences and underlying tension would manifest. Consider trying to discuss your frustrations with the Prophet . How do you think he would respond? What would be his recommendation to you to gain favor with Allah and live peacefully in this world? I would like to challenge any reader who is struggling in her own relationship to dig deep into the Sunnah and the Qur’an and find solutions relevant to her situation, be it related to child rearing, dressing or privacy, as some women have mentioned in their previous comments. There are codes of conduct that I could recommend (and a growing body of literature), but each of our challenges is slightly different; and the more we work to understand and improve our situations (and really tailor solutions to our situations), the more empowered and ultimately successful we will be inshaa Allah. Now, imagine being your mother-in-law. This may be more difficult than the previous exercises, as it requires moving away from our own ego, which is perhaps among the greatest spiritual tasks. It is also not a five minute exercise, and it may be ongoing, like a recurring visit to the food pantry. First of all, what do you really know about her? Do you know about her youth, about her teenage years, about her own marriage? Do you know her real interests, passion, and work experiences? Do you know about any challenges she faced with the deen? Try to imagine being her and how it would feel to visit your home? How do you honestly think she feels? If you think she feels well, alhamdulilah. If not, perhaps this may be a starting point for discussion and for improving your own relationship, not with your spouse as an intermediary. Again, I repeat, not with your spouse as intermediary. This is not an open gripe session, rather, it is an attempt to start building your relationship with your mother-in-law, directly, with Allah as witness, inspired and enlightened by examples from the Sunnah and Qur’an and with Qur’anic recitation potentially as an added means to connect. Finally, words do matter. If after all of this, we speak negatively about our mother-in-law to, for example, our own parents, friends, or children, we will think negatively, and this negativity may impact our interactions—not to mention how it may impact our own children and how they may treat their elders (including us) one day. It may be difficult at first, but try, and try again to hold your tongue, mindful that the angels really are writing everything down, and we will be accountable for all our deeds, however great or small. Whether we be Eastern or Western (or a combination of the two), hospitality is part of our deen, together with sincere attempts at peaceful co-existence. While sometimes a forgotten ingredient, love breeds love. Focusing on our Creator, and the character of His beloved Prophets will help us to dispel tension and achieve love in our home inshaa Allah. Please share your suggestions below! Umm Muhemmed is an aspiring hafidha and a student of Hafidha Rayhaanah Omar, founder of Fee Qalbee. She is also a development economist focusing on Sub-Saharan African electricity policy. Her recent works of fiction include A Qur'aanic Odyssey: Towards Juz Amma (available via Amazon) and Ya Sin: Towards the Heart of the Qur'aan (forthcoming), as described at: aquraanicodyssey.wordpress.com .